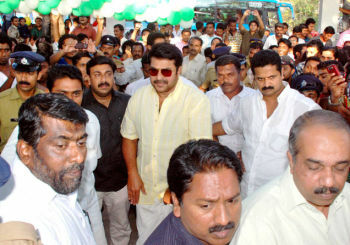 The public should ensure that the beaches here are neat and clean, actor Mammootty has said. He was addressing a gathering after inaugurating the beautified Kozhikode beach here on Saturday. “The beauty of the beach will reflect the aesthetic sense of the people in the coming days,” he said. The beautification of the 850-metre stretch of beach, from Lions Park to Corporation Office under the Kozhikode-I Assembly Constituency, was completed at a cost of Rs.3 crore. The smartened up coastal stretch has an entrance-gate, pavilions, walkways, lamp posts, fountain and granite-paved seats among other things. A 1500-square-metre parking space is also in place. A toilet block, cafeteria and gallery steps are the other features. The project, sanctioned by the Tourism Department in 2009, was completed by the Harbour Engineering Department. This is the third stretch of the beach being opened for public after beautification in the city limits in recent months. A. Pradeep Kumar, MLA, presided over the function in which Mayor A.K. Premajam was the chief guest. M.K. Raghavan, MP; district panchayat president Kanathil Jameela; and Tourism Secretary V. Venu and Director A. Shivasankar were present. Tourism Minister Kodiyeri Balakrishnan had inaugurated the beatified Bhat Road Beach recently.